Can you imagine raising four children under four during the depression—without a husband? Sat. Sept. 29 from 10 a.m. to 3 p.m.
Fall Book Fair on Sat. Oct. 20 from 10:30 a.m. – 2:30 p.m. at St. James United Church, Fellowship Hall, 306 Parkside Drive, Waterdown. Natural Abilities,197 Griffin St., Smithville, Mon. – Wed. 8:30 a.m. – 3:30 p.m.
A Different Drummer Books, 513 Locust Street, Burlington, Mon – Thurs 9:30 a.m. – 6 p.m. 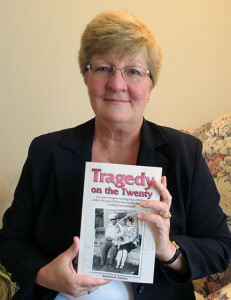 The Write Bookshop, 285 St. Paul St., St. Catharines, Mon – Thurs 9:30 a.m. – 5:30 p.m.
Tragedy on the Twenty is a historical fiction book based on an accident that happened on Highway 20 in April 1933—the worst year of the depression. The book includes other interesting news: the Toronto Maple Leafs are in the Stanley Cup Playoffs for the second year in a row. Will they defeat the New York Rangers to win the coveted cup two years in a row? Famous bank robbers Bonnie and Clyde have another shoot-out with police. Will they get caught this time? German Chancellor Adolph Hitler is making changes in Germany that has the rest of the world taking notice. Graphic Designer and Author Barbara Fanson has written over 30 books, some traditionally published and some self published. This is her first historical fiction book. While studying graphic design at Fanshawe College, she was the editor of the student newspaper Interrobang. After working a few years in the print communications industry, she wrote Producing a First-Class Newsletter, published by Self-Counsel Press. Then, she wrote Start & Run a Desktop Publishing Business, also published by Self-Counsel Press. While a professor for Seneca College, she wrote over 30 step-by-step computer books specializing in desktop publishing software programs such as Adobe Photoshop, Illustrator, InDesign, Microsoft Word, etc. 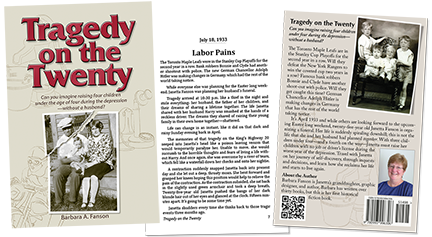 Since the publishing company did not want to get involved with computer books, she self-published them, selling about 100 a month at several colleges. Sign up for our newsletter Digital Digest and receive design, book publishing, and marketing tips.